Have you ever wondered if it’s possible to know how to watch 3D movies on PC? Or for the least, do you even know about the technology used behind the 3D film? Well, then the essential notion of 3D graphics is the fact that each of your eyes needs to observe various pictures. The method of making the illusion of thickness within an image is incredibly obsolete and is called Stereoscopy. What do you need to watch 3D movies on a PC/laptop? c) Preparation of a 3D video player for PC/Laptop. What are the hardware requirements to play a 3D movie on a 2D display? How to design your pair of Anaglyph 3D glasses? The process to know how to watch 3d movies on pc starts by preparing 3D glasses! To watch 3D movies, initially, there are three types of 3D glasses available – passive glasses – red/cyan glasses &amp; polarized glasses, and active shutter glasses. a) Polarized glasses are utilized for cinemas and 3D TVs. b) Active shutter glasses are designed for specific 3D TVs. Where can you buy them? That’s an easy question to answer because you can do that by either finding it from a local relevant shop or you can also buy them online from eBay, Amazon. a) Try to determine the lighter shade of blue color. b) The red color must be profound. c) Finally, the darkness level on both sides must not mismatch. How to watch 3D movie on PC without a 3D movie? Kindly ensure that the downloaded file is in 3D form. You can quickly identify that by opening the file in VLC/Windows Media Player. If two separate sections are shown for a nearly identical video, this means that you’re on the right track. How to prepare a 3D Player? Before starting, make sure that you have downloaded SBS (Side by Side) 3D movie on your computer. 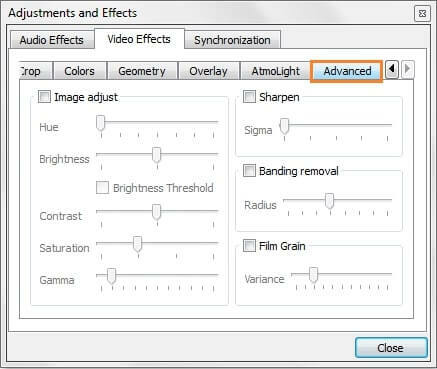 Step 1 – Open the VLC media player and go to Tools>Click on Effects and Filters. Step 2 – In the opened dialogue box, click on the Video Effects Tab and then click on the “Advanced” tab. 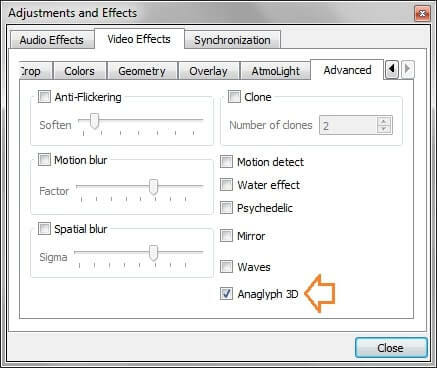 Step 3 – Finally, you will be able to see an option named as Anaglyph 3D. Check it and move on to click on the “Close” button. This will initiate the 3D effects on your VLC media player. Step 1 – Load your side by side movie. Step 2 – Press the 3D button at the bottom left. Step 3 – Right-click on the player window and select the color – Red/Green Color or Red/Green Dubious.